To update last week’s Jordan Conn article on Grantland: “If a team wins TEN out of 12 national championships in Canada, does it make any noise? Meet the Carleton University Ravens.” Well, the University of Ottawa Gee-Gees (just Google it) did, and fought madly and well, but the dynasty stands as the Ravens rolled on, 79-67. Did it make any noise? Well, just north of 7000 fans in the home of the NHL’s Ottawa Senators – yup, for all you Murricans reading, our national college hoops classic drew over 10,000 empty seats with the two local unis in it – made a fine effort. Sometimes the play-by-play guys were synchronized with the three cameras operating, and for a second-tier pro and a one-weekend-a-year ex-coach colour guy, the SportsNet 360 team did a fine job. There will be articles and photos in prominent Canadian news outlets that don’t normally touch Canadian Interuniversity Sports, but then even an apologetic, hockey-centric town like Canada will notice a third straight championship even if the Ravens didn’t win by 50 in the CIS final, as they did last year. Carleton’s fifth-year posts (6’7″, maybe) and co-captains hoist the WP McGee. Kevin Churchill, left, is a Master’s student in Philosophy. Tyson Hinz has big, slow but impeccable feet, and schools longer, quicker NCAA studs to their eternal bemusement. He flunks the “look test” but went for 30, with 6 boards and 5 assists in his final exam. Oh, and he’s a classroom ace, too. They got to 87, and then the basketball gods said enough.² No more Ravens in the all-time collegiate conversation. No more putting “Dave Smart” in the same sentence as “John Wooden”. Even though I knew and admired Dave, and was utterly dazzled by what dedication, unity and furious development produced in a Ravens team that wasn’t bigger and faster than everybody else but won anyway, it seemed to me that basketball justice had ultimately been served. ¹ I’ve read a couple of different numbers, but I’ll go with this one from the Canadian Press. Normally, I’d favour Joe, the retired Carleton prof whose Ravens emails are the most attention paid to this vacuum-sealed team’s accomplishments. ² A brilliant, 5’8″ point guard named Bradley Rootes led the Brock Badgers to the upset. I wrote about it here. Two years later, the Badgers won a surprise title when the Ravens got nipped in an overtime Nationals semifinal against Acadia. But ten titles in twelve years? Here we go again! This is the other mind-rattling number from those incredible Bruins teams, yup, the ones with (then) Lew Alcindor (later Kareem Abdul-Jabbar) and Bill Walton and a few more hall-of-famers, one of the all-time records-that-will-never-be-broken. This will create a brief stir in Canada, and next to none anywhere else, my ninth-floor nook here in Dalian being a lonely but wearily pleased exception. The Carleton University Ravens – who?! – and their chronically exasperated, never-say-perfect coach, Dave Smart, are now in the same sentence as Coach Wooden and his immortal Bruin squads, even if it’s only mine. And so it continues! March Madness is upon us. And even I, a self-proclaimed professional basketball non-fan, non-aficianado, non-watcher and just plain unimpressed other-than-basketball sports fan, will spend the next few weekends trying to watch as many college basketball games as is possible and still maintain some semblance of living. I get caught up in the brackets, the hype of the game and, of course, the annual pool that adds a level of excitement. I am no expert at picking teams, and generally choose teams with pretty colours, or known names from my short history of watching at this time of year. Georgetown was one pick I had for years. A few long shots and a predicted upset usually mean that I am out of the pool contention before it is one weekend old, but I still hope to pick the teams in the final four, or at least one of the final two. And I don’t even like basketball! A friend told me to compare basketball and lacrosse, to look at each game through the eyes of someone watching the other, and then I started to understand the game just a little bit more. I still do not like pro ball. I find it unpalatable to know that an open-heart surgeon makes less money than most basketball players. I am a firm believer that many professionals should be paid the millions that b-ballers get and leave the b-ballers to get what most professionals get in compensation for their work. Good policemen or firemen are worth their weight in gold when they help someone in need, yet pro ball players get recognition for throwing an over sized ball into a peach basket. 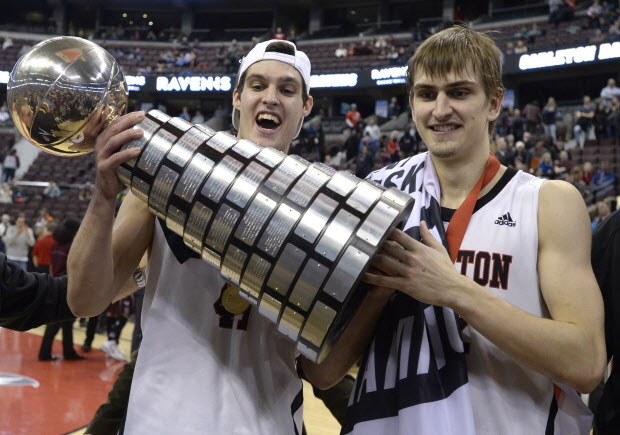 The Carleton University Ravens pulled off no small feat. Ten of 12! I don’t even put my shoes on the right feet 10 of 12 times. Good for them. Good for the coach that can take a team to that consistent level of play even though the players are not the same year in and year out. Unless, of course, there is an 11-year program at the university that I am unaware of. But it does lead me to the nagging question: How would the Ravens fare in a match-up against any of the final four teams? Could they compete? Is that even a fair comparison? The hype and glitz and glamour in the south and the lack of same in the north leads me to believe, as well as others I suppose, that the level of play is better in the south. Bigger arenas. Bigger hype. Bigger benefits to more players. Highly paid coaches. All resulting in better ball and better play. No? Well, I will have to leave that up to the people who actually know something of the sport, north and south of the border. All I know is that for one month of weekends I have to decide between watching the World Curling Championships, the final games of a dying NHL season, college basketball or The Big Bang Theory! Maybe I should just read a book, or get a life.